Just when Sheriff Serenity Adams thinks life is getting back to normal, the death of a young, pregnant Amish woman rocks the community. Is it circumstance...or murder? It's up to Serenity and her ex-Amish boyfriend, Daniel Bachman, to discover the truth about the new shaman-type medicine man who's brought his dark secrets to Blood Rock. But Serenity has secrets of her own, and if she and Daniel don't work it out, the reappearance of a woman from his past could threaten to ruin their relationship. In this riveting third installment of Serenity's Plain Secrets, beliefs are challenged, a way of life is questioned and family skeletons are unearthed, leaving no one untouched. 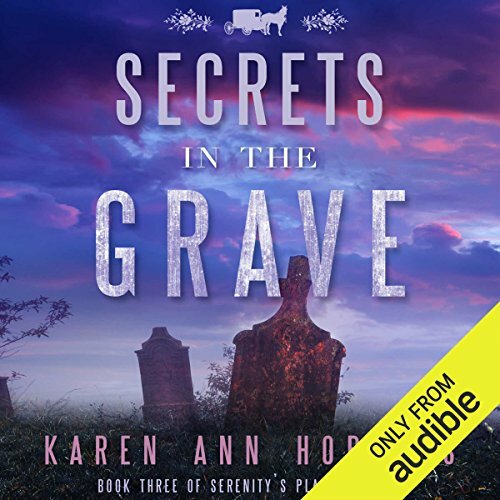 ©2015 Karen Ann Hopkins (P)2017 Audible, Inc. This story is quite convoluted. Religion and myth are mixed together to make solving this case difficult. Just who is a true healer amongst the Amish? And just who or what is the source of that power? Those are just a couple of the questions Sheriff Serenity Adams must answer in addition to realigning her personal belief system. Again, all of our favorite characters are back in this sequel (book 3) about the plain people. I really enjoy this series. I am so glad Istumblef upon Karen's writing. I am hooked! It's nice to read/listen to books that keep me thinking & trying to guesswho the killer will turn out to be. This is the first by Karen Hopkins series I have read.interesting mystery with a bit of romance tossed in. I found it a fun relaxing read much different from what I normally read. Enjoyed the change and will read the rest in this series. It was well preformed..recommend. book 4 here I come! looking forward to book 4. if the series doesn't end there I hope #5 is almost done! Good detective story with a lot of colorful characters which kept my interest all the way to the end. Very good narration. Another enjoyable installment in the series. Interesting case and characters. I wouldn’t start with this one because you’ll miss out on character and relationship development; plus, the cases from the previous two books are brought up so you couldn’t go back and read them later without knowing what happened. I recommend reading this series in order. I listened to most of this on audio but finished the last quarter on my kindle and I have to say that, given the choice of narrators, I recommend the print version over the audio. The book chapters are told from two different first person perspectives— Serenity’s and Daniel’s, but mostly Serenity’s. There are different narrators for each, so the same characters have different voices depending on who is reading the chapter. It’s a bit annoying. Also, the voice for Serenity doesn’t match her character. It’s not strong enough. She would probably be fine for a different book but I didn’t care for her as Serenity. The book “sounded” so much better in my head when I read it in print.